(Rick Egan | The Salt Lake Tribune) Brigham Young Cougar fans cheer before the big game at Lavell Edwards Stadium in Provo, Saturday, September 9, 2017. Provo • Stay the course as a college football independent or go back to a conference? Seven years after BYU left the Mountain West, a conference it helped form, and going it alone in football, the Cougars’ marquee sports program is at a crossroads. After a dismal 2017 season in which the Cougars went 4-9 and fired one of the most beloved figures in their football history, Heisman Trophy winner Ty Detmer, the stay-or-go question has divided fans, media members and former players more than ever. It continues to be a hot topic on social media websites, fan message boards and sports talk radio, mainly because of BYU’s struggles last season. Is the program in a nosedive, or was last season — the worst season since 1970 — an aberration? Every indication from school officials is that they plan to remain independent in football until at least 2023, when most major conferences' television contracts expire. Until then, BYU’s ultimate dream — an invitation to join a Power Five conference — is on hold. BYU athletic director Tom Holmoe said at BYU Football Media Day on June 22 that the “status quo” is the preferred route for now. “When the broadcast companies look to renew the broadcast rights, at that point in time there will maybe be changes in the landscape of competition,” he said. Still, the topic is worth exploring again as the critical 2018 season approaches. In a roundtable last January where the football team’s worst season in decades and Detmer’s dismissal were major topics of discussion, Holmoe was asked if BYU would ever “bail” on independence. “It is the same answer that I have always said: We are not looking right now to get into [another] league,” he said. The debate that won’t go away has heated up again as BYU coaches prepare to begin preseason training camp on Thursday. Having gone 9-4 in 2016, with four losses by a combined eight points, the program appeared on the upswing under the energy and enthusiasm brought by new coach Kalani Sitake. But everything went wrong in 2017, especially on offense. Another subpar year would be devastating, and perhaps cost Sitake his job. Though maybe leaning a little too heavily on last year’s results, some national and local media members are now urging the Cougars to reconsider their position and rejoin a league. That list includes Salt Lake Tribune columnist Gordon Monson, who originally supported the move eight years ago. He wrote that “things have changed” and BYU should rejoin the Mountain West to “breathe some life” back into its football program. Former ESPN analyst Brett McMurphy, who has covered college football nationally for nearly three decades, agrees. McMurphy said BYU can’t accomplish the goal of every non-Power Five team, which is to win its conference and get into a New Year’s Six bowl game. He said only BYU can answer the question of whether money from its ESPN deal is worth more than never having a shot at a New Year’s bowl, and “all the notoriety” that comes with it. 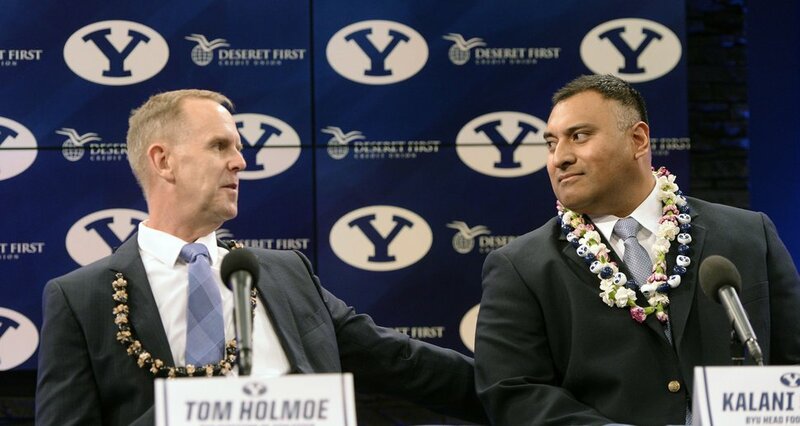 Al Hartmann | The Salt Lake Tribune BYU Athletic Director Tom Holmoe, left, announces Kalani Sitake as BYU's new head coach at a press conference in Provo Monday Dec. 21. Matt Brown, an editor at the website SB Nation, has written extensively about BYU’s plight as an independent and offers a somewhat different take, while calling the situation “complicated,” with no easy answers. Brown says a lot depends on the school’s aspirations. He said BYU is unlike any school in the country, which clouds the picture. An Ohio native who now lives in Chicago, Brown has been able to watch BYU play live several times and on television weekly. BYU fans who responded to an informal Twitter survey prefer staying independent to returning to a G5 conference by a 7-to-1 margin. Indeed, BYU’s average win total in its 12 years in the Mountain West is the same as it has been in seven seasons as an independent: Eight. However, BYU has posted just one 10-win season (2011) in seven seasons as an independent, compared with four seasons of 10 wins or more in its final seven seasons in the Mountain West. “Last year just clouds things so much,” SB Nation’s Brown said. A lot of people believe BYU’s schedule is more difficult as an independent than it was as an MWC member, but that’s not true. It is just front-loaded more, with ultra-tough games early and easy games late. That’s a drawback to independence almost everyone can agree on. Per figures compiled by the Provo radio station, BYU’s average strength of schedule as an MWC member was 65th in the country. As an independent, it has been 77th. Of the handful of BYU fans who voted for a change of course in the Twitter survey, most want a change because they believe independence has been a failure. (Chris Detrick | The Salt Lake Tribune) Brigham Young Cougars running back Squally Canada (22) celebrates after scoring a touchdown during the game at LaVell Edwards Stadium Saturday, August 26, 2017. Brigham Young Cougars tight end Tanner Balderree (88) is at left. Another fan, Steve Christiansen, suggests staying the course until 2023. “If a spot doesn’t shake out in the P5, they’ll have to consider the walk of shame back to G5,” he wrote. Several BYU fans mentioned lackluster home schedules, late-night kickoff times and the lack of quality opponents in November as drawbacks to independence. 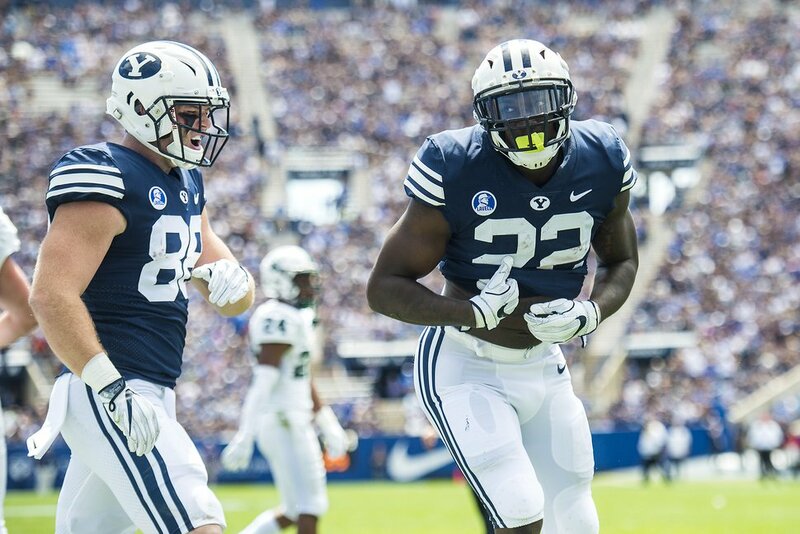 However, several noted that in 2019 BYU’s home slate includes Utah, USC, Washington and Boise State and a trip to San Diego State for the season finale. Utah resident Ryan Teeples evaluates the financial viability of organizations in their markets, assesses risk and opportunity, and evaluates advertising value and consumer demand in markets for products and services as the owner of Teeples Consulting. He’s not affiliated with BYU, but is a fan and has researched the viability and financial aspects of independence. He is passionate about the need for the school to stay independent unless a P5 conference comes calling. Financially, there’s no question that independence has been a boon for BYU, Teeples believes. Although BYU is a private school and does not have to open its books to the public, it does have to report revenue and expenses to the U.S. Department of Education. According to the Equity in Athletics Data Analysis published yearly by the USDE, BYU’s football revenue in 2016, the latest year available, was $26.1 million. In 2010, BYU’s final season in the MWC, it was $15.6 million. That’s a pretty big leap. The Mountain West’s Boise State, which has a more lucrative television contract than any of its MWC cohorts — financial considerations not likely to be given to BYU should it be invited back — reported $21.3 million in football revenue in 2016. The next highest was San Diego State, at $13.7 million. Pointing to those figures and recent news reports that G5 schools such as New Mexico and Cincinnati are struggling financially and looking at cutting certain athletic programs, Teeples says it would be a “big mistake” for BYU to join a conference outside the Power 5. Teeples also believes that ESPN will continue as BYU’s broadcast partner until 2023, saying the cable sports giant would not have extended its contract with BYU through 2019 last year if it didn’t value what BYU brings to the table, even as an independent. “In my opinion, independence is the only sustainable course for BYU, barring a Power Five invite,” Teeples concluded. Could Cougs get a cold shoulder? He said feelings since “have thawed out” and mentioned that future football games with SDSU and UNLV have been scheduled and talks are ongoing with Wyoming and Air Force.